I chose this floppy mop head from several litters of Schnauzers and named him Jonah. Somehow the name just seemed to fit, and the pup seemed to fit me. He was just over 8 weeks old but I could tell he had the makings of a future barn dog. He was sturdy, confident and curious. I know what you’re thinking. Schnauzers are pretty far down the list when it comes to naming the most typical barn dogs. Jack Russell Terriers, Queensland Heelers, Corgis, Aussies and Border Collies are the popular choices, and understandably so: they’ve been bred for centuries to herd livestock or root out varmints from the stables. 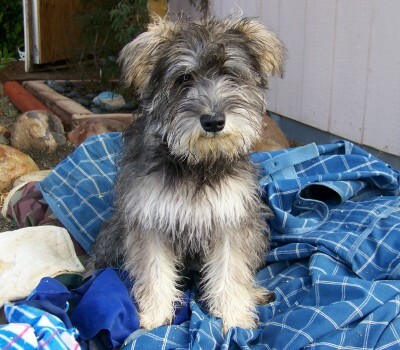 As prototypical barn dogs, I envision Schnauzers ranking somewhere between Malamutes and Lhasa Apsos. Thus I ended up with a baby Schnauzer for Christmas. Fortunately, Jonah is following in the paw prints of the Schnauzers that came before him in our household. He already goes on a leash. He lies down, sits and holds a “stay” on command (even off a leash, mind you) and is, unless he’s overly pre-occupied, housebroken. 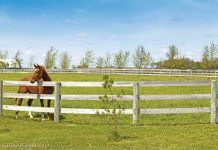 Outside, I’ve begun to trust him more and more around the horses, even as he ambitiously explores the realm of the horsekeeping area. For example, he understands that he is not, under any circumstances, to come into the stall or paddock. That’s what the command “Out!” means. I’m sure with time that Jonah will develop into the best possible barn dog a Schnauzer can become. At least I hope so. Meanwhile, until he satisfies his appetite for sampling manure, I’d prefer he not larp me on the face with his tongue. Try having a border collie with 3 legs trying to herd 3 horses.Be thankful he listens mine only listens when I start chasing her out while spooking the horses. My other 2 seem to know they are only to be in the barn when the horses aren’t around or when the farrier is there. He has them spoiled with hoof trimmings. I am so glad you got another schnauzer! I have a little white miniature schnauzer named Bianca, and we absolutely adore her. Good luck with Jonah! JONAH HAS ALREADY DECIDED HE’S A TRUE HORSE/RANCH/BARN DOG. HE LOVES TO GO OUT EVERY MORNING AND AFTERNOON AND KEEP ME COMPANY WHILE I CLEAN THE PENS AND THE STALL. JONAH ESPECIALLY LOVES IT WHEN I HAPPEN TO SPILL A FEW HORSE PELLETS OR LEAVE A CARROT TIDBIT BEHIND. YUMMY! BUT AT LEAST IT’S BETTER THAN HORSE POOP.